District Sports considers the in-game decisions on referee to be final. While we appreciate and welcome feedback on all elements of our league, including referees, challenges to both calls and non-calls will not be reviewed by league management. Decisions made by referees in District Sports matches cannot be reversed and will not serve as justification for a game to be replayed. A. Game Time – Each games will consist of two 20-minute halves with a 2 minute half time or as required due to adjusted game times. Shin guards are mandatory and are an absolute requirement for all players. Footwear – Only soccer/athletic shoes are acceptable. No street shoes or metal cleats. Referee’s decisions on footwear suitability are final. District Sports will provide games balls. 5v5 CoEd indoor – Teams may not have more than three (3) players on the field of the same gender on the field at any one time. If a team shows up without at least one player of each gender they will automatically forfeit. 5v5 Men’s Indoor – While these leagues are advertised for Men, teams may field players of any gender. There is no CoEd requirement. 5v5 Women’s Indoor – These leagues are for players who identify as female, trans, genderqueer, nonbinary, and other players who self-select as appropriate to the program. Teams must be ready to play the game within 8 minutes of the scheduled game time. If a team is not ready to play with three players, then they are considered to have forfeited. For CoEd, if a team shows up without at least one player of each gender they will automatically forfeit. Should teams have enough players that they don’t need to forfeit, but not enough for a whole team, they may pick up players from another team provided that they are registered District Sports Players. If remaining players from the scheduled team arrive after the start of the game then any players who have been picked up from another team should leave the game. Any team who picks up players should not add more players than can play on the field at any given time. This means that the team should not have any substitutes. This does not apply to goalkeepers. Teams may add additional players if they do not have their own goalkeeper present. Field player substitutions may be made at any point during game play or stoppages, with the exception of free kicks. Players must enter and leave the field from the halfway line. Failure to do so will result in an automatic yellow card. Goalkeeper substitutions can only be made during stoppages in play with the consent of the referee. Rules regarding allowed goal area and penalty spots will be determined based on facility. Referees will communicate this to teams. Goals may be scored from both the offensive and defensive halves, by any player. Goalkeepers are, however, not allowed to score with their hands by throwing the ball. A goal kick is awarded whenever the ball goes across the touchlines. Indirect kick-ins will be taken whenever the ball has been kicked out of bounds or hits the ceiling. Opponents must give 5 yards of space. Direct Penalty kicks are awarded for fouls that occur within the penalty area. Kicks are taken from the three- point arc. All other restarts are Indirect. The goalkeeper is not permitted to use his/her hands when directly receiving a pass from a teammate; if a goalkeeper uses his/her hands, an indirect kick will be awarded to the opposing team. Unlimited Substitutions may be made on the fly without the consent of the referee. Discipline – The Team Captain assumes the responsibility regarding team leadership and maintenance of order and discipline. District Sports expects each Captain to set a positive example for their players in promoting good sportsmanship and self- control. 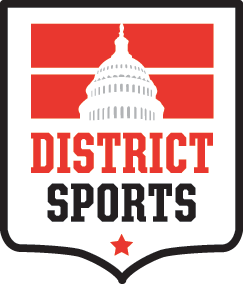 If a player not registered with District Sports receives a Red Card, the Captain will be asked to serve the player’s suspension. Sideline Control – The Captain is responsible for the behavior of his/her bench area – including fans. After being verbally warned or cautioned (yellow card) by the referee for unsportsmanlike behavior from his/her bench area, the Captain will receive a red card if the situation persists. The referee also has the power to eject any spectator at any time at his or her discretion. District Sports reserves the right to suspend players from league play for as long as it chooses without appeal. A. Game Time – Each games will consist of two 25-minute halves with a 5 minute half time or as required due to adjusted game times. Footwear – Only flat soled soccer/athletic shoes are acceptable. No street shoes. For all leagues EXCEPT Saturday Men’s D1: A goal kick is awarded whenever the ball goes across the touchlines. For Saturday Men’s D1: A throw from the Goalkeeper’s hands will restart play whenever the ball goes across the touchlines. All leagues EXCEPT Men’s Saturday D1: The ball may not be thrown over the half-line. Men’s Saturday D1: The ball may be thrown over the halfway line. Goal kicks may go directly over the half line in the air. Throws must touch a player or the ground before crossing the half-line. Slide-tackling is NOT permitted. Goalkeepers are allowed to slide, if attempting to block a shot, and they are not sliding in an aggressive or dangerous manner.